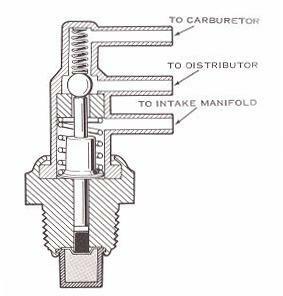 Many Ford engines, including the 428 Cobra Jet, use a distributor vacuum control valve (also called a coolant temperature sensing valve or a ported vacuum switch (PVS) valve) that opens and closes in reaction to changes in coolant temperature. 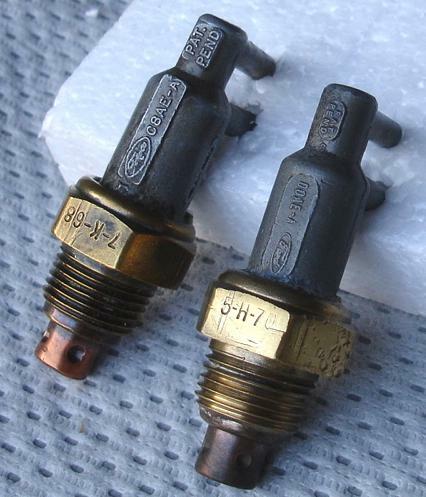 The 1975 Master Parts Catalog identifies the valve used on the 428 Cobra Jet using service part number C8AZ-12A091-A (Motorcraft part number DY-126). 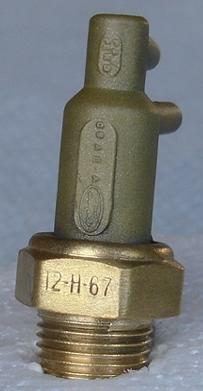 The valve is identified using two different engineering part numbers: C8AE-12A091-A and D0AE-12A091-A. The engineering part number appears on the valve in a short form that excludes the 12A091 basic part number. The valve includes a brass fitting that screws into the thermostat housing and a pot metal assembly that includes three ports. According to the 1975 MPC the same valve was used on a long list of 4, 6, and 8 cylinder engines from 1968 through 1971. The valve controls vacuum applied to the distributor vacuum advance to increase engine speed by a minimum of 100 RPM when the coolant temperature reaches the high end of its normal operating range. When working, the valve changes the vacuum supply to the advance from ported carburetor vacuum to full intake manifold vacuum. Test procedures can be found in the ignition system section of your factory service manual. 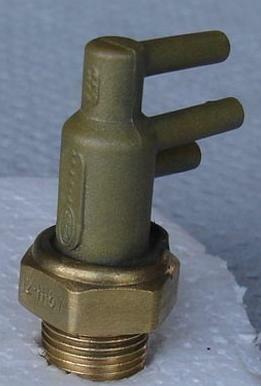 The top port (marked "1") on the valve is connected to the carburetor. The middle port (marked "D") is connected to the vacuum advance (on a dual diaphragm advance it should be connected to the primary (front) diaphragm). The bottom port (marked "2") is connected to the intake manifold and (on cars equipped with a manual transmission) to the vacuum advance secondary (rear) diaphragm using an inline vacuum "T". The cut-away image shown above is from page 116 of Glenn's emission-control systems by Harold T. Glenn, Copyright © 1972 by Harold T. Glenn. 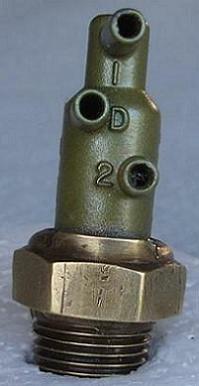 Note the date code stamped onto the flat surface of the brass nut. Current thought is that the date code is represented in "Month-Manufacturing Plant-Year" format. These valves were originally manufactured by the Dole Valve Company, who had manufacturing plants in (among other places) Hanover, Illinois and Kalamazoo, Michigan. The date code includes a month numbered from 1 - 12, a manufacturing plant code of either "H" (Hanover) or "K" (Kalamazoo), and a two-digit code representing the year of manufacture. Looking at the two examples above, we see "12-H-67" (December 1967, Hanover) and "10-H-6" (October 1969, Hanover); the "9" appears to be missing from "69" due to the location of the stamping at the edge of the nut. There is no clear change-over date identified for the switch from the C8AE-A valve to the D0AE-A valve, but the October 1969 date shown above for the D0AE-A valve is fairly early in the 1970 model year. The cast identification information that appears on each valve has been seen to appear reading from both top to bottom and from bottom to top. The picture above shows both possibilities and two other date codes: "7-K-68" (July 1968, Kalamazoo) and "5-H-70" (May 1970, Hanover). Thanks to Jeff Speegle for the pictures used here.